August 14, 2010 -- Can fans carry a player to the finish line? If so, last night at the Rexall Center proved it. 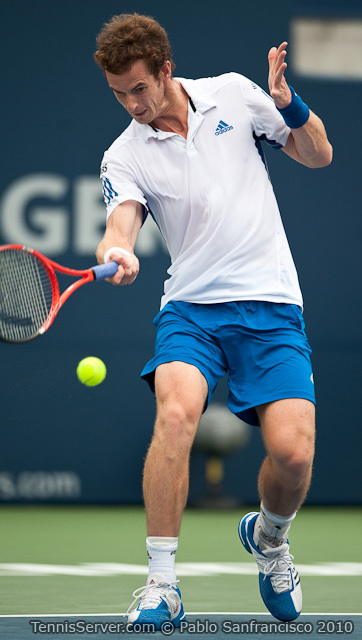 Lone cries of 'Tomas' stood out the way John Isner would next to Melanie Oudin. Canadians wanted Federer to win. Their cries implored him, don't give up... the promised land is right up ahead. "The crowds were absolutely amazing," Federer said in his post-match press conference. "Rarely you get those kind of atmospheres so I knew that was something special. I'm very thankful." 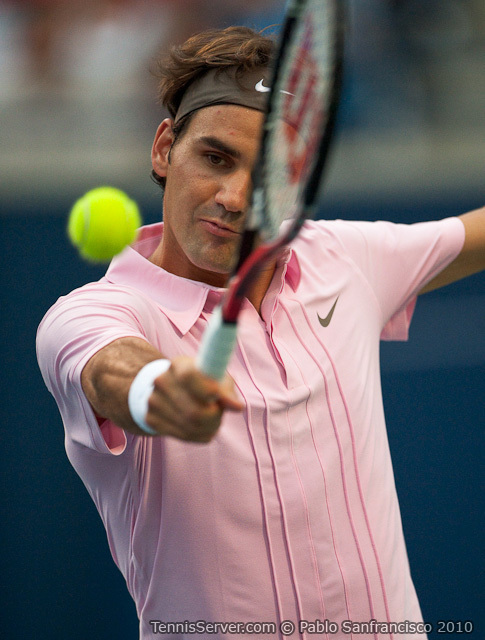 Early in the match between Federer and Novak Djokovic tonight, the same Federer allegiance rolled around the stadium. However, the Serbian faction wasn't going to stand by silently. They pumped up the volume as Djokovic dumped shot after shot in the first set. He couldn't hit a big point. He acted distracted, lethargic, aggravated and annoyed. If the match had continued along those lines, all fans would've demanded refunds. At 5-1 Federer served for the first set. 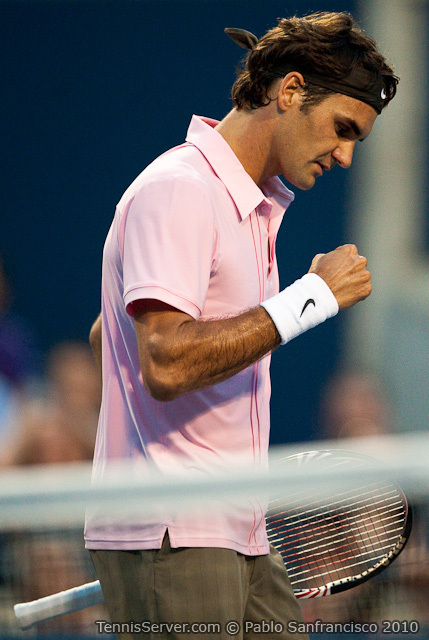 "That's the Roger we love," a Fed fan cried intuitively knowing, or hoping anyway, that the set was soon to be over. He was right. But that slumped look from Djokovic cannot be trusted. The second set proved it. Back and forth the two went in the third game. 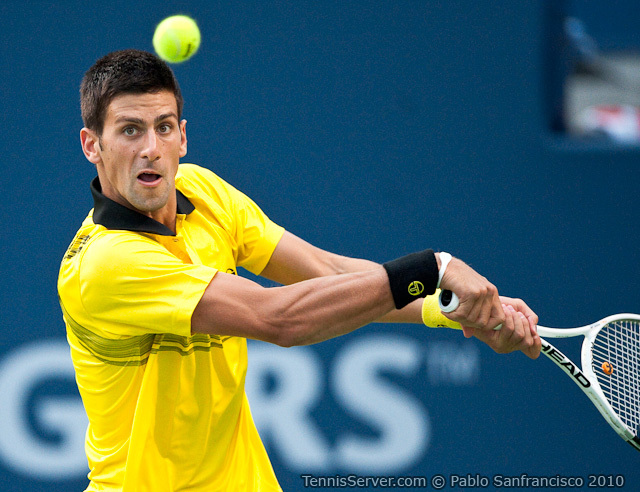 Federer could've broken, but Djokovic steadied his ship. Then... he held, smiled to the crowds, and raised both arms in victory. He was off the pity spot and cranked. He won the next three games and the set 6-3. Roger Federer gets loved every place he travels. He's an international sports star and he is considered a consummate sportsman. The paparazzi doesn't camp out on his doorsteps at home in Bottmingen, Switzerland. But zip around the Internet and you'll see long-lens shots of his kids and wife Mirka sun bathing on the beaches of the world, or strolling in quiet parks of unidentified cities. "I have always around the world great support, but when it gets so loud and so exciting, it's obviously something different. 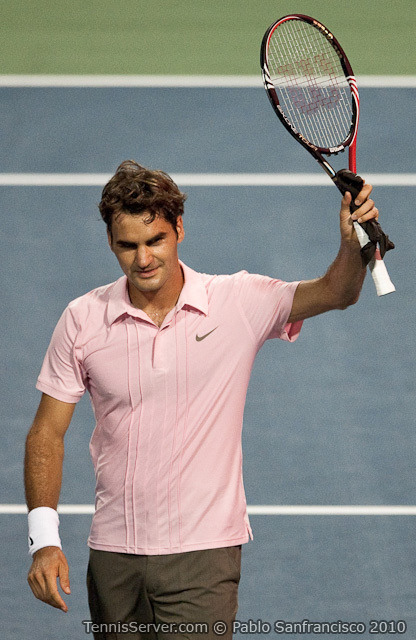 Adrenaline starts going, and you hope you come out on the better end," Federer said yesterday. The Serbians were outnumbered by Federer fans, but their booming voices carried. Fans almost were more competitive than the men in the match. "It's like a soccer match; that's good," a Serbian supporter said to friends. "Otherwise these are like funerals." Djokovic used the crowd, too. 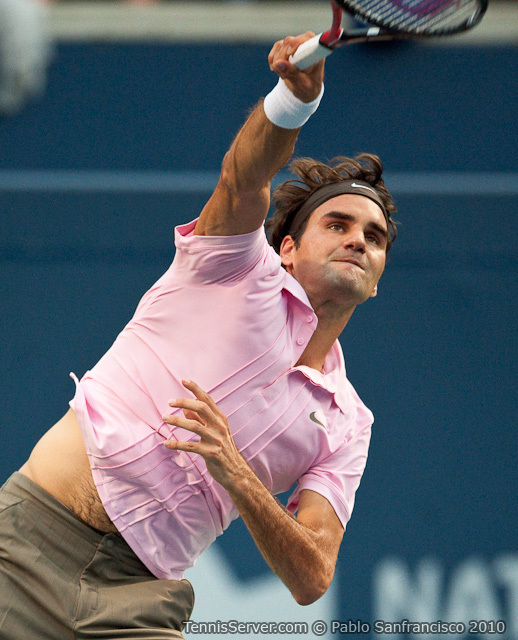 An extended rally went in his favor soon after Federer broke him in the third set. Fans went bonkers, as Nole (No-lay) raised his index finger intimating he's on his way to number one, and watch out Federer. 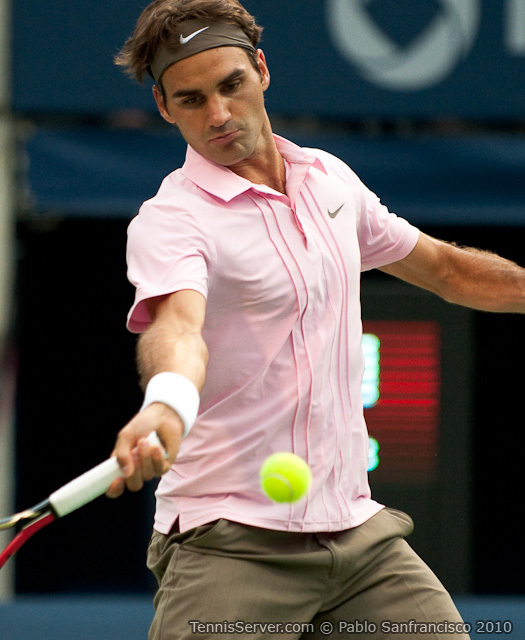 In 2008 when Federer suffered lingering effects from mono following the Australian Open and lower-tiered players beat him, like back-to-back wins from Guillermo Canas in Indian Wells and Miami, Novak made pointed references to surpassing the Swiss in ranking status. Novak held up his index finger, sending the message to crowds that I'm on my way to the top, just as he had tonight. 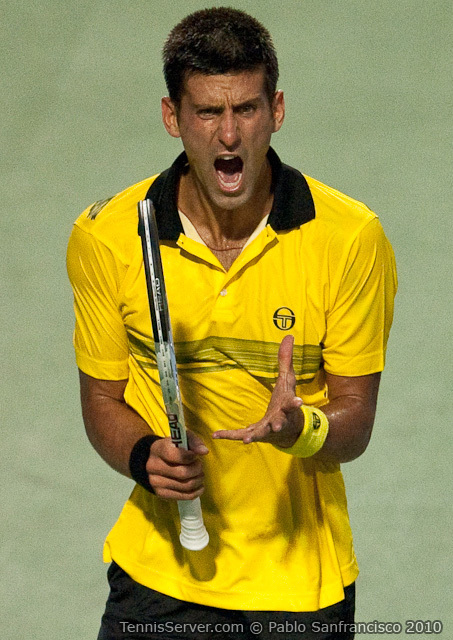 It was during this span of his career that Djokovic made enemies, but also won hearts through on-court theatrics. 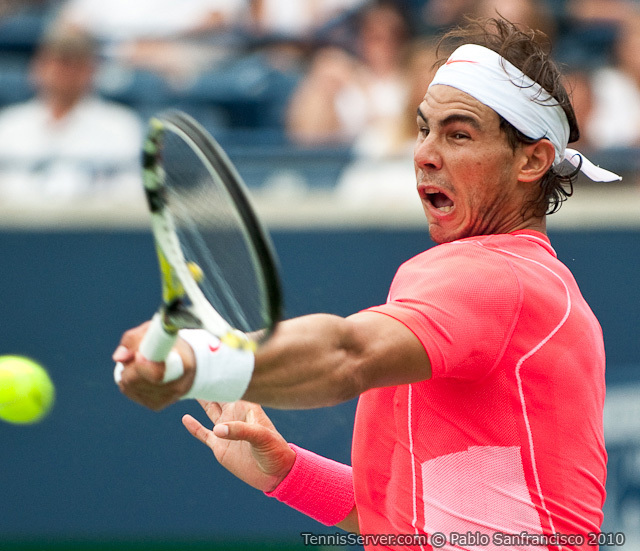 He imitated Maria Sharapova's serve, for example. But then it all stopped suddenly. He said he had to concentrate on tennis. His career wasn't a joke after all. His parents, too, applied a heavy hand. They, more than Novak it seemed, wanted a son at the top of the pops. Of course Djokovic wanted that, too. Every young tour player dreams of being number one. 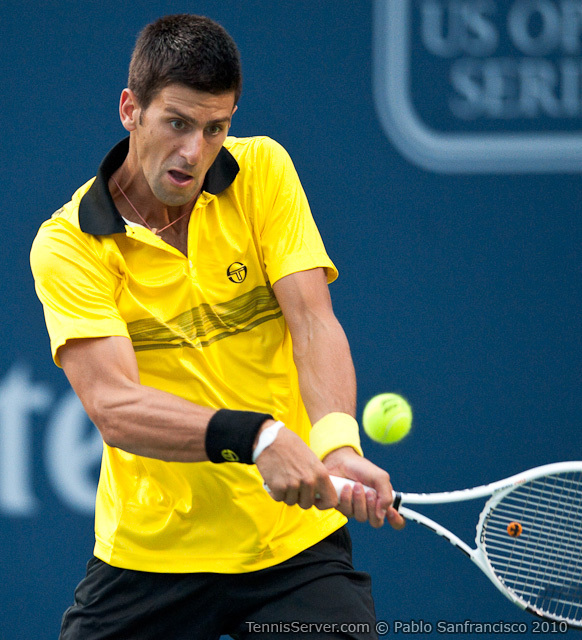 Toronto fans remember that Djokovic broke through here in 2007. 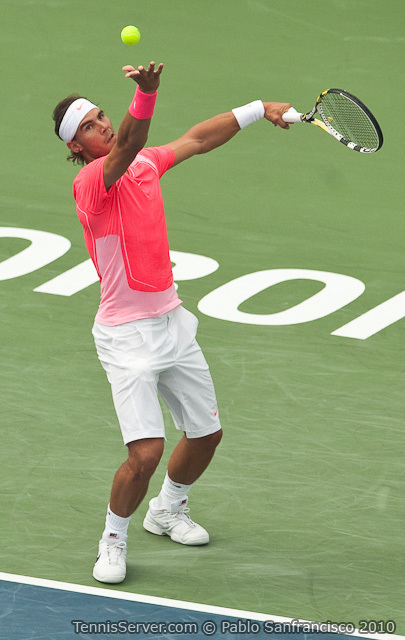 On the way to winning the title he defeated Roddick, Nadal, and Federer, which was in the final. He became the first player to beat Federer and Nadal at the same tournament when they were ranked one and two. Groups of Serbians have flocked to his matches this week, not only tonight. He felt supported. 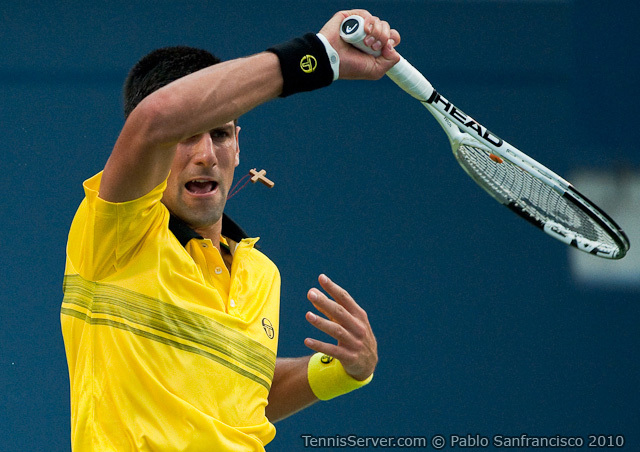 About a revival of the jocular Djokovic? "It really comes spontaneous," Novak started, slouched in his chair. "If the moment's right I'll do it. I will not force something, but if the fans really want and if the moment is good, if I don't make somebody feel bad, why not?" 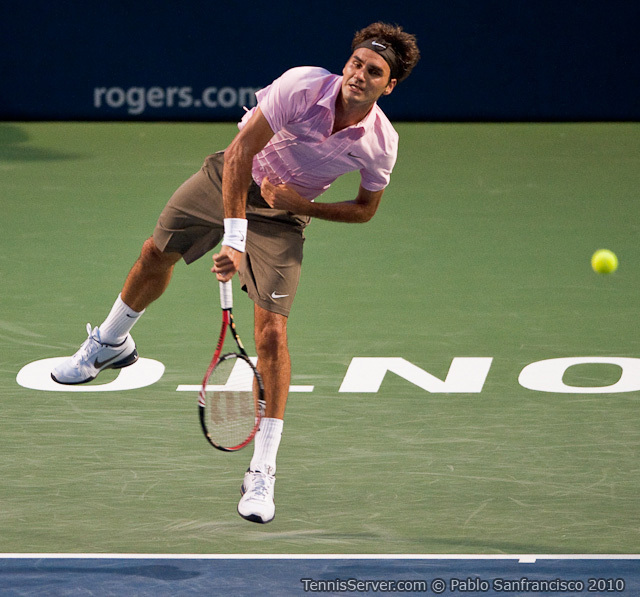 Federer took an early lead in the third set tonight. 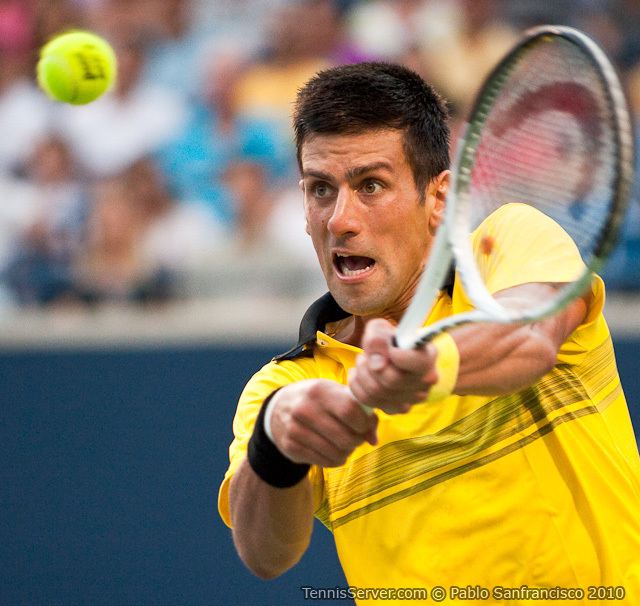 But the pesky Djokovic stormed back. 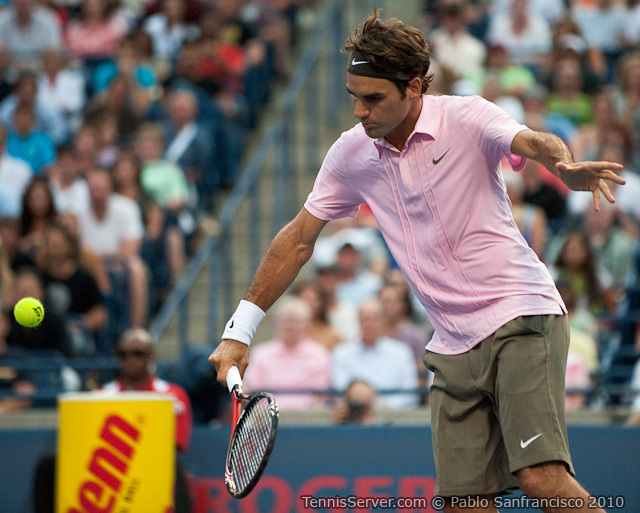 With his consistency off just enough Federer took bigger risky shots. They worked. 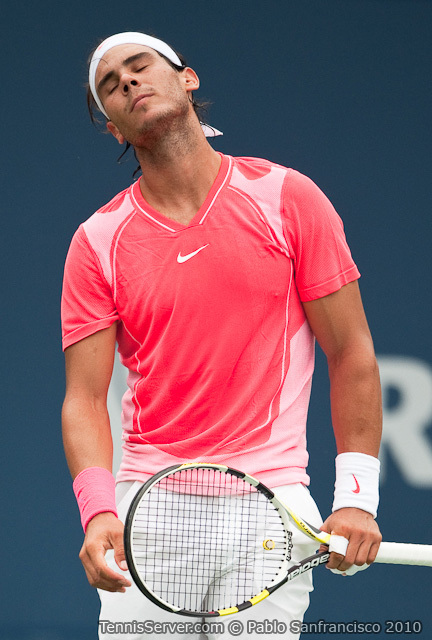 He closed the match at 7/5, but not before a lost soul yelled, "Let's go Nadal." 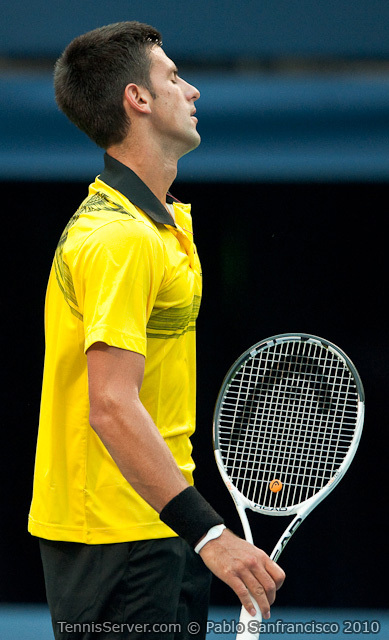 "I think it wasn't the best performance by my side," Djokovic said. "I wasn't serving well when I needed to, and I made a lot of unforced errors on my backhand side." "To come through obviously feels great," Federer said. "Playing against tough guys back to back is something that makes me very happy, and I got a chance now to win the title tomorrow. I'm excited about it." 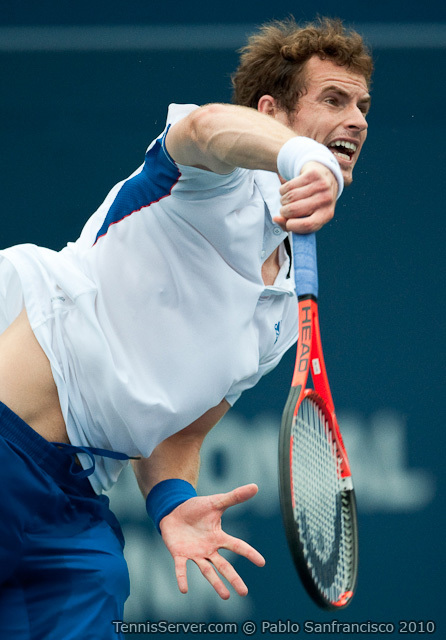 In the first semifinal of the day, Andy Murray upset Rafael Nadal. 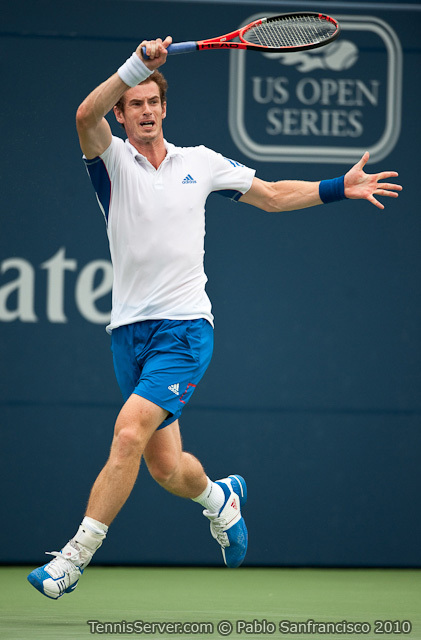 It was a shocker two-set victory for the Scot and defending champion. Simply put, Murray outplayed Nadal winning 63 64. He drove the ball and didn't hang back in his usual defensive pose. He drop shotted the speedy Spaniard, and served big winning 82% of points on his first serve. 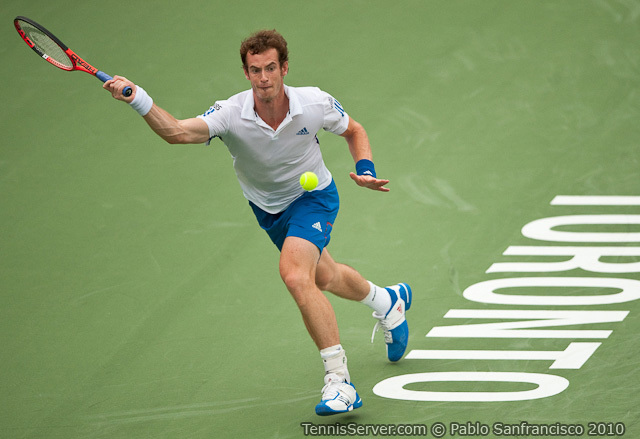 Murray acted mature out there on Centre Court, too. There was no despondent expressions or screaming at his box. Instead, he moved from point to point with a purpose clearly in mind -- to win. 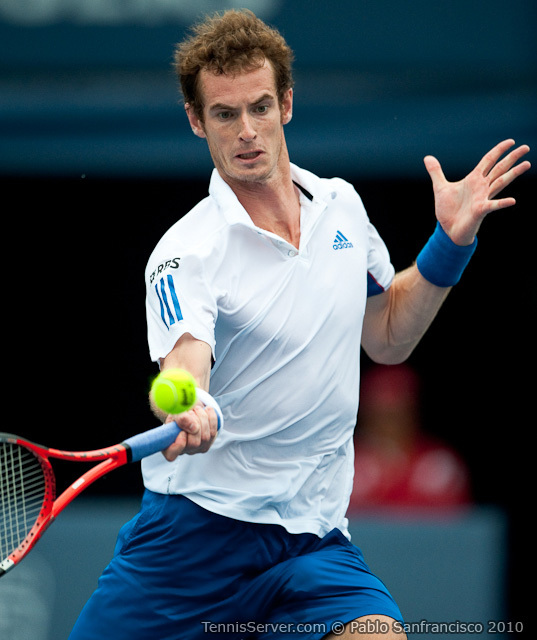 "I had a pretty good game plan the last couple of matches," Murray said with his eyes cast downward. "When I have played well I've always kept a pretty level head on the court. Something that makes me feel mentally good is if I prepare well for the tournaments and go in feeling like I practiced all the things I wanted. 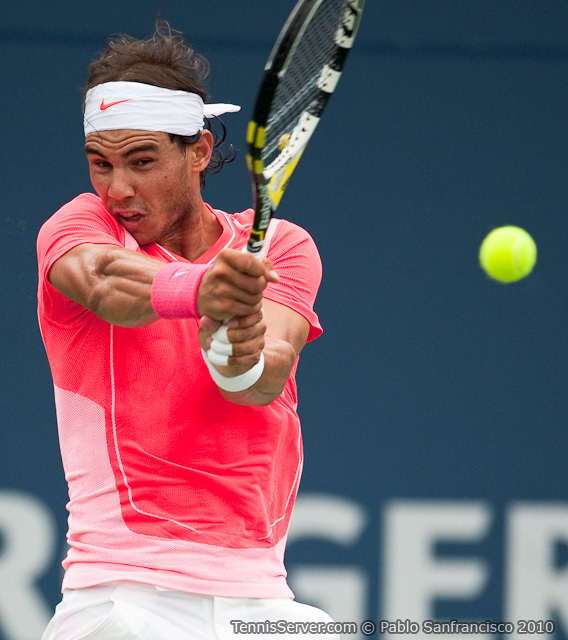 I go on the court [with] a lot clearer head." 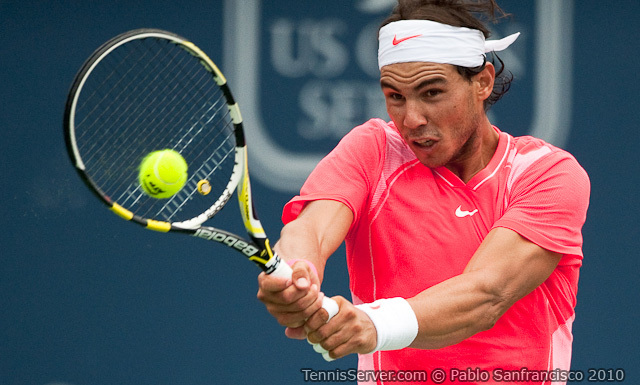 Popular wisdom says that to defeat Nadal don't rally with him from the baseline. Many have died trying. However, that guidance could get turned on its head. 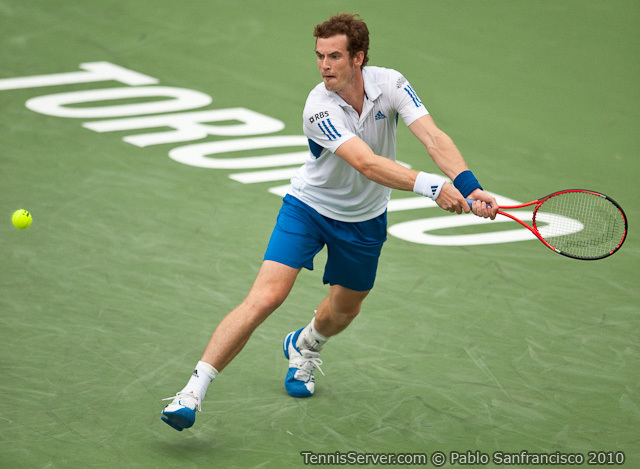 Murray hung with Nadal on long points and forced errors. 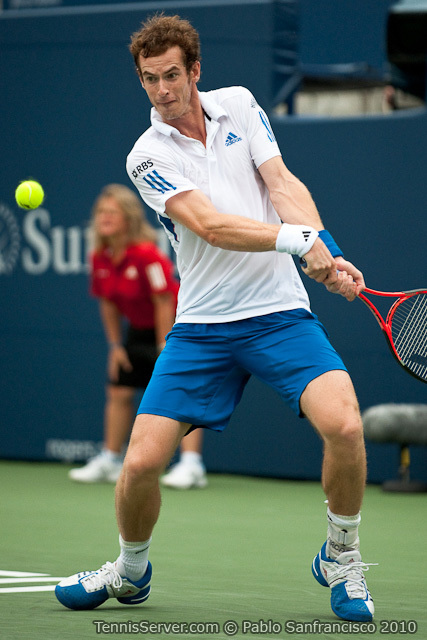 Coupled with that excellent serving percentage, Murray transformed into a, can we say it for sure, an offensive player. 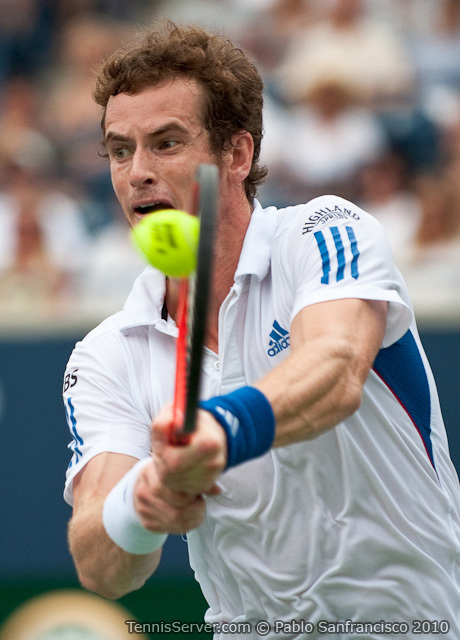 "I enjoy playing that way," Murray said hesitantly. 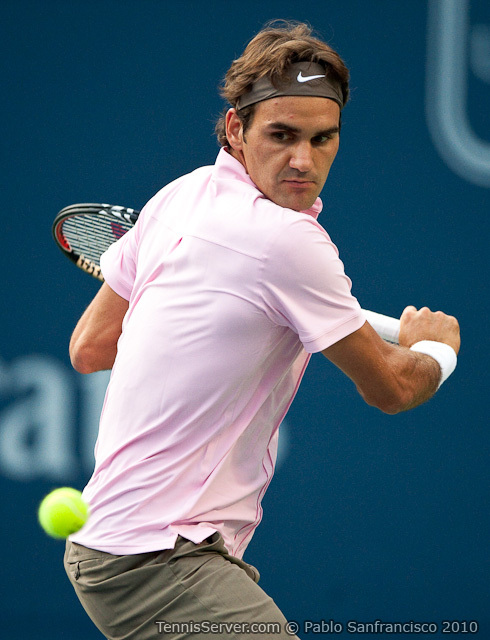 "When I have needed to against the best players I've always tried to play more aggressively. I want to enjoy playing my game, sort of express myself on the court how I want." Crowds' reactions to Murray were subtle, here in a country tied to the Queen of England. Perhaps it's the British manner of things -- subdued and proper. Whatever... Murray deserved rollicking applaud from all on hand. 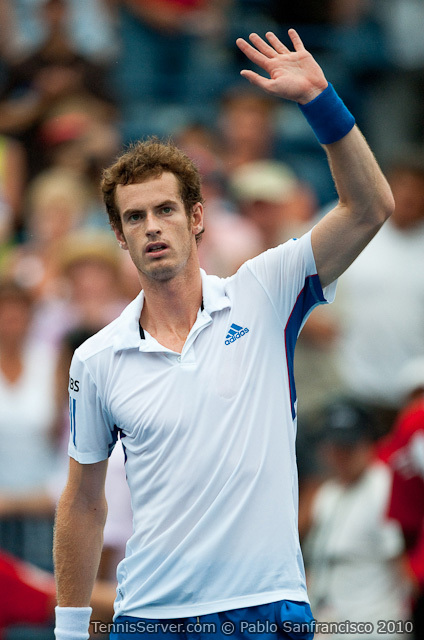 The fact is Andy Murray doesn't attract gobs of rip-roaring attention around the world of tennis. Of course, he hasn't been around the top four as long as the others. He's also only 23, unheralded on the international non-for-profit foundation scene, and a bit flat when it comes to expressing himself to the media. You'd think the lad would speak the Queen's English, but he has a thing or two to learn about subject-verb agreement. 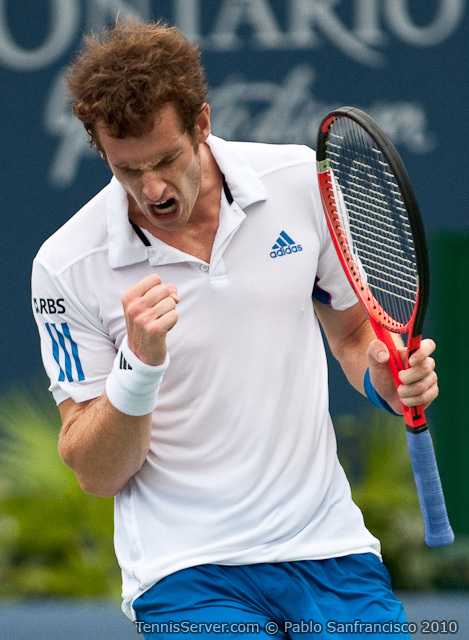 To get to know Murray is to understand him through his tennis. He's quick, athletic, with one of the best split-steps on court, and sincerely dedicated to getting better. His taciturn appearance might only be shyness. 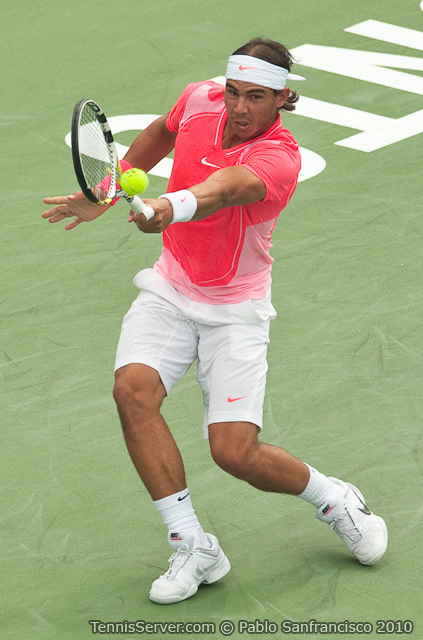 Rafael Nadal lost the match because he didn't serve well. He said so himself. 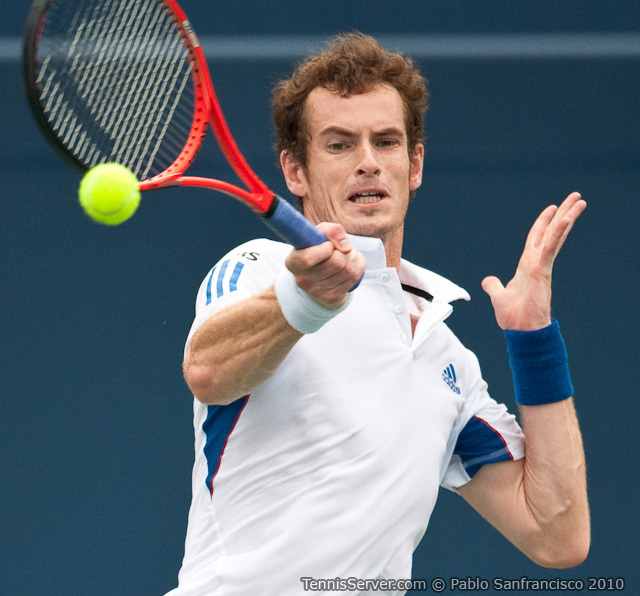 He had his opportunities, but Murray stormed back. 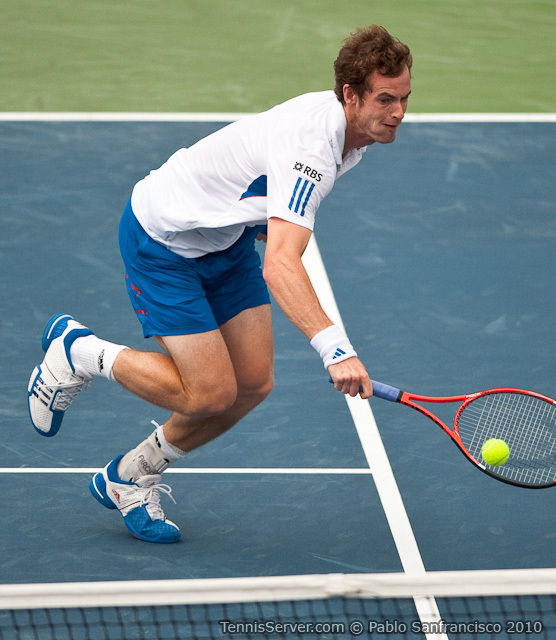 "Playing Andy always is a challenge. I told you yesterday," Nadal began. "I had chance at 3-all, 15-40, and made a double fault. But sure is not an excuse. After that he played better than me. My serve was the worst thing in my game. 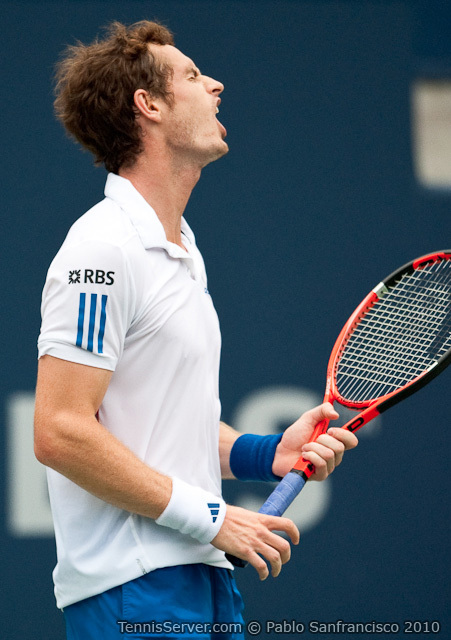 To win Andy I had to serve much better than what I did today." 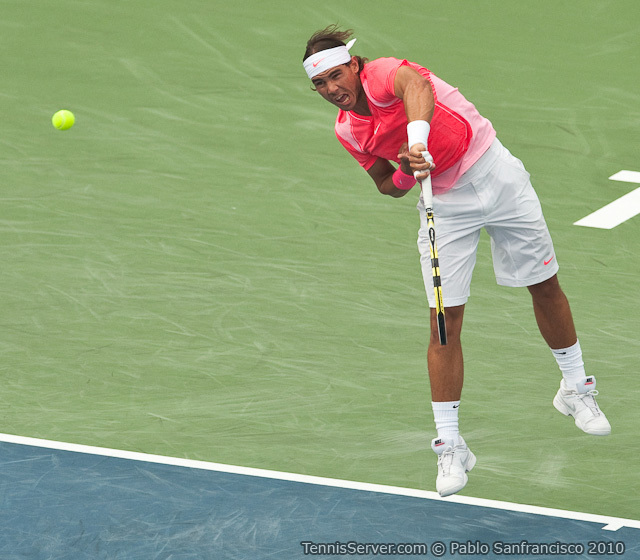 The Spaniard certainly had his share of attention this week in Toronto. 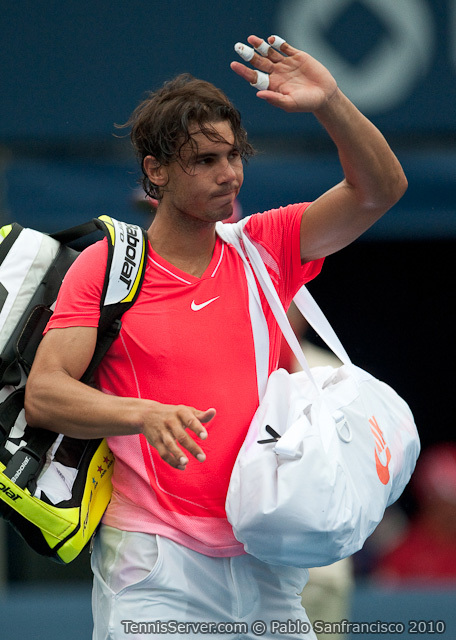 He showed fans a relaxed Nadal when he paired up with Novak Djokovic for doubles, only to lose in the first round. Otherwise, the world's #1 is as serious as can be in a match. No jokes. No distractions. 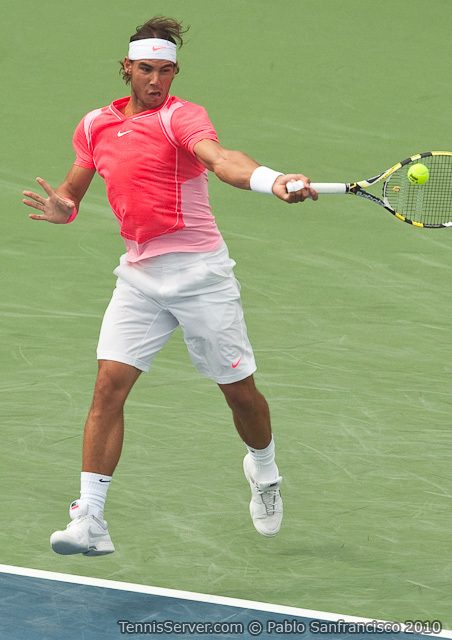 Fans have endeared Nadal for his spirit, his game, and all his quirky and persistent gestures, the most annoying being the pant pinch, or tug, as John McEnroe has described the behind-the-scenes reach and pull. Perhaps fans brush it aside now, since he's done it in front of millions probably a million times. But why someone doesn't take the lad aside and slap his hands is beyond conception. He's the world's number one player, for goodness sake. Nike supposedly talked with him, or someone in his entourage, and they said their hands were tied. Too bad Nadal's aren't.